More info:Price (per person) based on 2 adults sharing a room for 3 nights on a B&B basis, with 1 including dinner. Also includes return train travel from Glasgow to Fort William, 1st class travel on the Jacobite, return ferry to Skye & taxi transfers on Skye. The West Highland line is considered by many train aficionados to be one of the finest rail journeys anywhere in the world. It is that wild and wonderful mix of the likes of Rannoch Moor and Glencoe, passing lochs and waterfalls, streams and striking uplands, all changing by the minute depending on that ever varying Scottish light. In addition, our tailor made West Highland railway holidays take you not only from the Glasgow starting point up to Fort William, at the foot of Ben Nevis, but also over the sea to the Isle of Skye. Spend the first night of this tailor made Scottish trip in a remote highland village called Spean Bridge, where your small, locally run hotel overlooks Ben Nevis, serves organic meals and always has treats like home baked scones on offer. The next day you board the West Highland railway again on the historic Jacobite Steam train which takes you out to the coast, over the architectural splendours of Glenfinnan viaduct, to Mallaig Harbour where you catch the ferry to the Isle of Skye. Spending two nights at a traditional waterfront hotel in a tranquil spot in the south of the island, you have a whole day at leisure. Choose to enjoy the natural and cultural highlights of Skye by taking a small group tour or hire a car and explore the coves and coastal trails, or the rugged uplands and woodlands in the interior. Alternatively, just relax at the harbour, perhaps stroll around and sample a few of the spirits at ‘The Gaelic Whiskies’, which produces whiskies in the original Gael style, unchilfiltered. Your final journey after returning to Mallaig by ferry is by train, again on the West Highland railway all the way back to Glasgow, allowing you lots of time to take in your final views of these unique, dramatic landscapes. We are continually increasing our range of public transport holidays for those who actively choose low-carbon transport. This holiday has been carefully-designed to allow you to explore the West of Scotland and even the magical Isle of Skye without a car. It takes you beyond the end of the train line, by ferry and short taxi transfer. We recommend that you explore further on foot or by public transport in the local area. The accommodation chosen takes you a little off the beaten tourist track, so that you will have a more authentic experience. In each place, there are plentiful local walks, and some short trips available by local bus - we will provide suggestions and recommendations in your holiday pack, but do check the most up-to-date information with the staff at your hotel. We take the utmost care to choose local business partners who share our values and commitment to sustainable travel, preferring to work with locally-owned and managed businesses wherever possible. Your hotel in Spean Bridge is committed to home-cooked organic food, while the shellfish for the hotel restaurant on Skye is landed at the local pier. We build long-term relationships based on mutual trust with our business partners, with a joint commitment to excellent customer satisfaction and care for the environment. For us, true sustainability means promoting and helping to maintain a way of life, where the economic benefit from tourism can make a genuine difference. That’s why we work almost exclusively with local, family-run businesses, not with large corporate organisations. We build close and lasting relationships with our business partners, based on mutual trust and an unerring commitment to customer satisfaction. We carefully select these partners to ensure that they share our values of sustainable and responsible travel. For example, the small hotel featured in this holiday on the Isle of Skye is based in the heart of a Gaelic community, and all staff are encouraged to learn the language, whatever their original native tongue. All of our holiday packs include "Robert's Recommendations", our specific tips on places to visit, places to eat and places to shop locally, all of which have been researched by us, and many of which are off-the-beaten track. Spending two days on The Isle Of Skye, it was so peaceful and tranquil, and everyone was very welcoming too. I would love to have stayed a bit longer, so a return journey will be on my list! The Jacobite Steam Railway was great fun also. Pack lightly, and take comfortable walking shoes! There is a lot of travelling on trains etc, so you have to be one step ahead all the time, but it is all very enjoyable. The tour of Skye is well worth doing, the scenery is breath taking. Yes, any where a little remote will benefit from tourism, as it can be a good source of income. Amazing! A lot to see in a few days, a little more time to relax would have been nice , but the scenery is quite spectacular, even if the weather isn't at times! Be prepared for all weathers. Yes, I would imagine our holiday benefited local people. I don't know how it would reduce environmental impacts or support conservation, but I don't think it did any damage. Excellent. The operator organised everything superbly and gave us very instructive paperwork and maps. The Jacobite Steam Train was the highlight! Our tour operator made everything so easy. Also be prepared for unpredictable Scottish weather! Yes I feel it benefitted local people as we stayed at family run accommodation with local staff and local suppliers. Excellent. We went for my Dads 70th and we both loved it, it was the ideal trip. Perfectly organised by the team and must mention Ken & family at our accommodation. So helpful & friendly, a relaxing lodge rather than hotel with superb food and drinks. 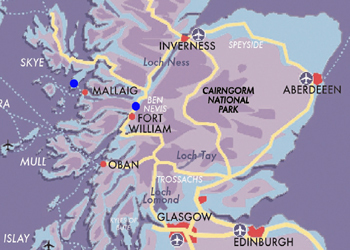 The train journey from Glasgow to Spean Bridge, then the Jacobite steam train from Fort Wiliam to Mallaig. Then the trip round Skye. The views were so beautiful. If possible allow enough days to see everything at a gentle pace. Very much so. The population of the Highlands depends on tourism for a lot of their income. Being able to walk in the inspiring scenery. May was a good time to be in Scotland. If taking the steam train, be sure to book first class. The first class carriages were beautifully renovated, but the other carriages were not very good and I would have been very disappointed had I been booked in them. Since tourism seems to be the main activity I suppose we contributed but using the hotels and visiting attractions. Many thanks indeed Cheryl. We are continually increasing our range of public transport holidays for those who actively choose low-carbon transport. We take the utmost care to choose local business partners who share our values and commitment to sustainable travel, preferring to work with locally-owned and managed businesses wherever possible. The scenery is stunning. A pity about the weather, but can't be helped! Do prepare for the weather. Wind factor can make it feel even colder. And, as you want to be outside as much as possible, take proper walking type waterproofs, whether you are a serious walker or not, and whatever the forecast! The holiday benefits local economies, of course. But to think it can actually reduce 'environmental impacts' is preposterous. It also did nothing to support conservation - it was a holiday, for goodness sake! I really enjoyed it. The weather tried to spoil it, but failed!